The week of April 21-April 27 2003 saw a lot of developments in the great Megg Egg Hunt (which was officially started early February 2003 although the egg was mentioned briefly around the time of Halo's release). Credit needs to be given to individuals that contributed to the finding of the egg via endorsed methods. Megalomaniac was the first individual to get the end result of the egg, even if he did not understand what it meant or how to reproduce it. 2and2make5 along with Shishka were the first people to send in a detailed (and correct, if not overly explained) version of triggers along with explanations for clues � and get credit for the complete egg find. WadoSG was the only person to have logically reasoned most steps via clues given. Tiny and ~I am Banana~ get credit for posting the first generally recognized public steps to finding the egg and keeping the hunt going. Sep7imus should also be mentioned as he gave the hunt and the egg the moniker: The Megg. Thanks needs to be extended to the users and administrators of the Subnova Megg Forum, HBO (halo.bungie.org) Forum, the xbox.com Halo Forum, Haloeggs Forum, teamxbox.com Forums, and the Battleground Halo Forum for their collective efforts and patience in the search. There were literally thousands of hunters participating. Thanks to everyone, and lets do it again next year. The Megg, as it is affectionately known, was a private gift from Jaime Griesemer (Designer on Halo, Lead Designer on Halo 2) for his then significant other, Meg (a.k.a. Pallor). 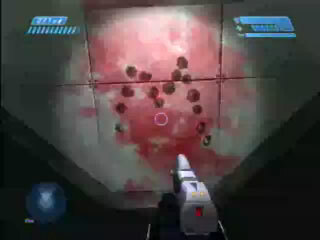 The egg was a completely scripted event with multiple triggers buried in the Pillar of Autumn level of Halo: Combat Evolved. The Megg was created entirely by one person, for another person as a gift of appreciation. It was not intended for public viewing en mass. The gift incorporated many elements of the game that Meg enjoyed. It was more complex than just a visual picture, and required some thought by the designer, as well as devotion to extended hours to incorporate it into the game. The whole process, triggers, actions, visual and ending is the full egg. The egg was a nod to the recipient and a thank you for all the grief the game itself caused in her life (imagined or real). It was quite the perfect personal gift. Not to mention the fact that it forever will stand in one of the best selling video games. The original phrases given to the public were not "clues" but more of a description on what the egg was and entailed. "Carnage before" referred to the amount of killing you needed to do before you reached the Megg and the end of the journey. "Impossible tasks as possible" was in reference to making it past the invincible marines alive and finding your way to the sealed room. "One maker" was a nod to the fact that Jaime Griesemer made the level and the Megg. "Mathematics births gore" has to do with the actual triggered bullets that spelled out the "M" and heart on the ceiling. The script was the math that made the gore. "Devotion" was a two-pronged term. It meant devotion of the creator to the owner exemplified by the visual message and the devotion you needed to have in order to reach the end on your own. "Pain" had to do with the amount of hits you would be taking and how many times most people would have to start over. In other words, it isn't easy. In fact, its legendary. "Before you die, you see the Megg" is a throw back to the movie "The Ring". It is in reference to the fact that you cannot escape alive once you have seen The Megg. Game over. "Just keep in mind Jaime likes me - a lot. "Like" is an enormous understatement. I also enjoy massive carnage in games. Blood and bullets make me smile." Originally from an HBO post, that was the most descriptive information given about the end result. The bloody heart riddled with bullets and the "M" seems to fit that description quite well. The Queen quote "Look up to the skies and see" was a direct reference to where you needed to be looking. It was the most blatant directional help the public received. You need to look up to see the Megg since it is on the ceiling. "Its not an audio egg. But it may make you scream." Probably the most controversial sentence posted, it simply means it wasn't an audio file. Making you scream is all relatively applied. Meg screamed for joy and was excited about the egg. Some people would scream in relief that the search was over. A few would scream out of frustration on the journey. Others would scream because it simply did not live up to their own inflated expectations. Additional information on the background events and hunt can be found at the Subnova Megg Egg Story Page by Shishka and on the HBO Megg FAQ. 1. Start PoA on Legendary, single player. Unknown if it works on co-op. 2. Skip the cutscene, turn around, and jump on Master Chief's cryo tube after it closes. 3. Jump on top of the shield regenerator. 4. Jump on top of the walkway. 5. Look up, then walk towards the exit while on the walkway. 6. Once done, turn around and walk to the back. 7. Jump on top of the barrel. 8. Jump down to the barrel below it. 9. Run around on these barrels. 10. Jump back on top of the top barrel. Do this by holding crouch right before the jump reaches its apex. 11. You should hear the crewman leave - he says "This way!". 12. Wait for the explosion. Music starts. 13. Jump back on top of the walkway. Walk towards the door, jump off walkway and head for the bridge. 14. Run past the Australian Marine. 15. Once at the bridge, walk PAST Keyes WITHOUT triggering the cutscene and jump down to the ladder. Wait for the message on climbing ladders to appear before jumping up. 16. Climb up and talk to Keyes. 17. Head for the exit. Kill all three grunts. The order doesn't appear to matter. 18. Get the Assault Rifle by the door. Reload it for a full clip. 19. Kill a standing crewman near the door without a headshot. With what weapon doesn't appear to matter. 20. Once the invincible marines come for you, shoot at them with the Ar until your clip is empty. (the door will open exactly when Cortana says "rampant"). 21. Duck behind the pillar next to the door, reload, and fire at them some more. 22. Run for the door. It should open by now. 23. Go down the hall. Look up. There it is. 24. Now you're screwed - you can stay in the Megg room, but if you leave, the invincible marines will kill you. Even if you run past them, the door to the rest of the Autumn is locked. Nice knowing you. Just when you exit the cryo-tube, run around to the right, and hop up to the canister thingy with the yellow on it. Stand there for 10 seconds, then run through the shield generator toward the marine. Follow and watch him die, go over pipes normally, and find the ozzie marine- jump over him- don't follow. Go to the bridge, get Keyes' gun, go out the hall and get ammo, go back, kill Keyes, then hide in the bridge entrance corridor. Wait about 10 seconds, and run for the open door behind where the invincible marines spawn from. If you make it through the door, they won't follow- go to the end of the hall, and look up. A bloody heart with an M in in. How sweet. Those instructions satiate the triggers. They are not the way the egg was demonstrated originally � but they work. Thanks to HBO for providing hosting and mirrors. Other films will be added later if they are high quality and to the point. Right: Picture of the ceiling showing the bloody heart with the "M" written in the middle by bullets. Bullet points were scripted individually. Image courtesy of BOLL. The Megg Egg Hunt was a learning experience for all parties involved. Never before had the independent Halo communities overlapped so much on a project. For the most part, the communities seemed to be enjoying the hunt. A few dissenters seemed to voice their opinions loud and clear not to mention at every chance they had. The hunt polarized most participants immeditaley. It was not the intention of the creator or owner to turn the community into a bubbling pool of chaos. Certainly it was not the intention to make people frustrated, cranky or lose sleep over the egg. It was the intention for the egg to make one person smile and she did.